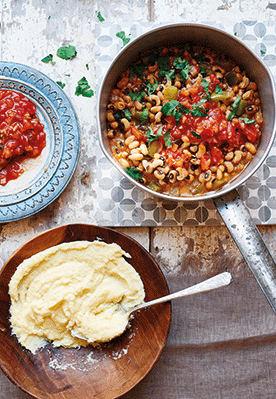 Use a pressure cooker and fast-cooking black-eyed peas to make this tasty chilli in no time at all. Alternatively, if you don’t have a pressure cooker, you can cook the chilli in a saucepan and increase the cooking time to 1 hour. 1. In an uncovered 6-quart (6-litre) stovetop pressure cooker, heat the oil over medium heat, then add the cumin seeds and let sizzle for about 5 seconds. Add the onions, oregano, cinnamon, bell pepper, black-eyed peas, water (stand back to avoid sputtering oil), and 2 tablespoons chilli powder. Taste the liquid and add more chilli powder if you like an intense chilli flavour. 2. Cover and bring to high pressure over high heat. Reduce the heat until it is just hot enough to maintain high pressure and cook for 11 minutes. Turn off the heat and allow the pressure to come down naturally. 3. Remove the lid, tilting it away from you to allow any excess steam to escape. Stir in the salsa, tasting and adding a little more if you like, and season with salt. Simmer over low heat for a few minutes to allow the beans to pick up some of the salsa flavour. If the chilli is too soupy, use an immersion blender to partially purée the mixture. 4. To make the salad, put the lettuce in a large bowl, drizzle over the oil and toss to coat, then sprinkle with the vinegar and toss again. Season to taste with salt and pepper. 5. When you are ready to serve, stir the cilantro (coriander) into the chilli. Serve with the green salad and cooked polenta. Recipe extracted from The Everything You Need to Know About Diabetes Cookbook by Dr Karin M Hehenberger, published by CICO Books (£14.99) Photography by Ria Osborne © CICO Books.